Keeping up with its commitment to push boundaries and bring unique and disruptive content, Zee Tamil - after the blockbuster show Junior Superstars has announced the launch of its new show, India's most definitive singing talent hunt - Sa Re Ga Ma Pa Lil Champs. The show promises to bring every member in the family together to celebrate the joy of great music. Sa Re Ga Ma Pa Lil Champs aims to open doors for talented children who dream of becoming the biggest child singing sensation. 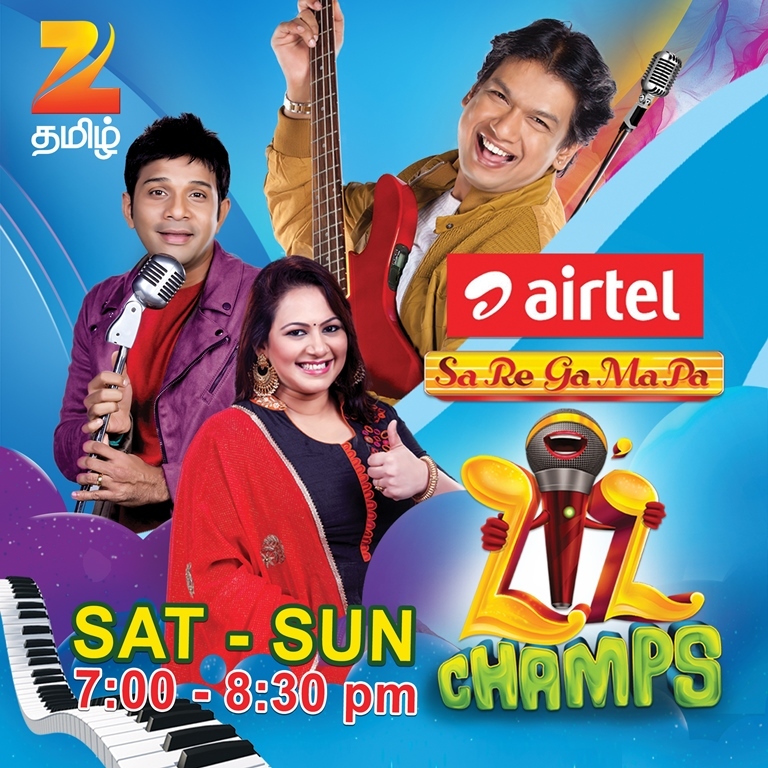 Sa Re Ga Ma Pa Lil Champs is an amazing opportunity that aims to discover hidden talent in the state. The best singer in the age group of 4 to 14 years will be chosen from the 15 children selected from auditions held across the state & through a mega audition where their mettle was judged. The selected group of children were put through a series of grooming sessions for the ultimate competition where the best amongst them would be crowned as 'Lil Champ - Best Child Singing Sensation'. Sa Re Ga Ma Pa Lil Champs will be judged by prominent personalities - Sujatha, Vijay Prakash & Karthik. All the judges are popular & celebrated Singers/Composers. The show will be hosted by popular television personality Archana. Sa Re Ga Ma Pa will premiere on 24th of December, Saturday at 7:00 pm. This 90-minute show will run for 16 weeks & has Airtel as the title sponsor. Launch of SGMPA Lil Champs is backed by a marketing campaign spread over three weeks which includes ATL, BTL, Television, Radio, Cinemas, OOH & Digital.